Do you realise your reluctance to recycle that discarded phone could be linked to the dramatic decline of gorilla populations in the Democratic Republic of the Congo? The link between hoarding disused mobile phones and the decimation of Grauer gorilla habitats is explored in a paper published today in PLOS ONE, authored by University of South Australia researchers and Zoos Victoria. The two organisations evaluated the first six years of the ongoing 'They're Calling On You" mobile phone recycling program run by Zoos Victoria, as part of a national campaign operating in Australian zoos. As part of the program, zoo visitors and the broader Victorian community were educated about the value of recycling discarded phones to extract special metals used in their construction—the same metals which are being mined in the eastern Democratic Republic of Congo (DRC), not only destroying gorilla habitats but also funding wars and human rights abuses. UniSA Conservation Psychologist and Great Ape expert Dr. Carla Litchfield, the paper's lead author, says if 'conflict' elements—including gold and coltan—can be recovered from old mobile phones, there is less incentive to mine gorilla habitats for the same minerals. "For every 30-40 mobile phones that are recycled, on average, one gram of gold can be recovered," Dr. Litchfield says. "Just as mobile phone sales are soaring, and gold content is increasing in some smartphones, natural sources of gold are expected to run out by 2030." The authors point out the barriers to recycling used phones, including lack of e-waste recycling points in many countries, secrecy around the phones' mineral composition, privacy concerns around accessing old data, and just plain hoarding. In Germany, by 2035 it is predicted that more than 8000 tonnes of precious metals will lie in unrecycled mobile and smartphones, and in China, by 2025 an estimated nine tonnes of gold, 15 tonnes of silver and 3100 tonnes of copper will also be out of the supply loop in 0.35 billion unrecycled phones. "Hoarding is problematic since precious metals are not extracted and returned to the circular economy, creating the need to mine these metals in wilderness areas. "The other issue is that if people do discard their old phones, most dispose of them in their household waste, ending up in landfill, where they leach toxic metals." 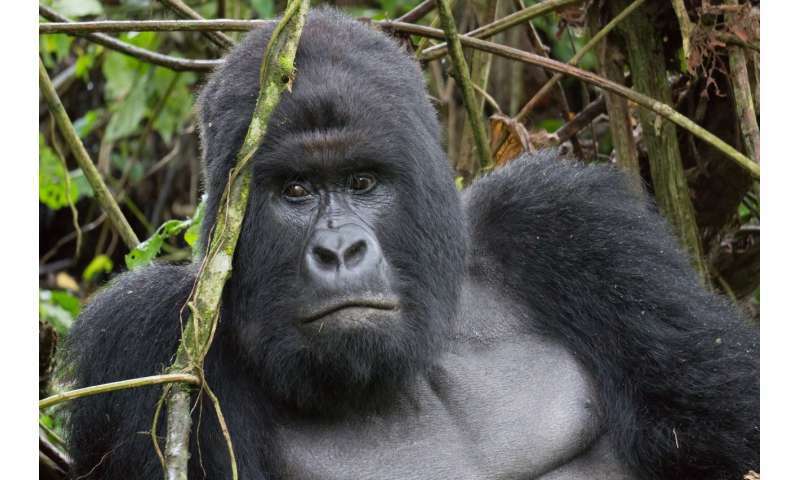 Recent population estimates of Grauer gorillas in the DRC show a dramatic 73-93 per cent decline, with less than 4000 remaining in the wild and the species now listed as Critically Endangered. Distinguished primatologist Dr. Jane Goodall launched the national mobile recycling campaign at Melbourne Zoo in 2009 to educate visitors about the link between mining in the DRC, the destruction of gorilla habitats, and the importance of mobile phone recycling. By 2014, zoo visitors in Victoria had donated more than 115,000 old mobile phones for recycling as a result of the social marketing initiative. "This number may seem a drop in the ocean—representing just 0.01 per cent of the one billion retired phones out there—but when you look at the result in the context of a state of six million people, it is very impressive," says Dr. Litchfield. "Hopefully this campaign can be rolled out globally and then we could really make a difference." The paper, "Recycling 115,369 mobile phones for gorilla conservation over a six-year period (2009-2014) at Zoos Victoria" is published in PLOS One. A fix to our cell-phone waste problem?